From $20.00 Some options in stock. Order in the next 10 hours, 5 minutes and it will go out today! Some options in stock. Order in the next 10 hours, 5 minutes and it will go out today! 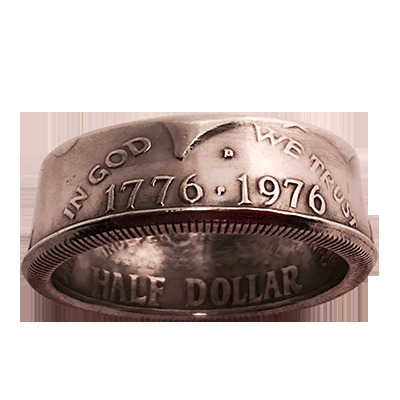 This uncirculated 1976 Bicentennial Kennedy Half-Dollar has been transformed into a ring. Each ring is unique and took hours to make. In the old days coins were beaten with a spoon or hammer to create a silver dent-faced ring. However this ring was created by a modern day wizard who's used a method for keeping the artwork on the coin mostly intact inside and out. Plus, the ring has been polished and custom sized to fit you! This numismatic jewelry can be displayed and worn as a piece of art or used to do a Karate Coin, Spellbound, Ring & String, etc.